Tierra Farm is located in Valatie, NY. Tierra Farm is a small, employee-owned, certified organic producer and roasting company in upstate New York. They maintain a diversified organic vegetable farm in Valatie, New York, but specialize in nut and seed roasting and dried fruits. As true believers in organic foods as a way to nurture the land and the body, they only handle and sell certified organic products. They generate over 70% of their electricity with solar panels and recycle over 60% of their waste. Allergen and Facilities Information: All of their roasting, mixing and flavoring is conducted in-house, at their certified organic, peanut-free roasting and processing facility. 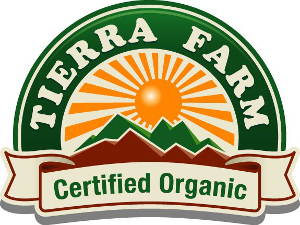 In 2014, Tierra Farm became Certified Gluten Free!